There is no subject more controversial or sensitive than the conversation about the best burgers in Auckland. Whether you’re an old-school beef, cheddar and pickle purist, or a new-wave Korean crispy octopus on a brioche bun type, everyone has an opinion on who serves up the best meat-between-bread in Auckland. 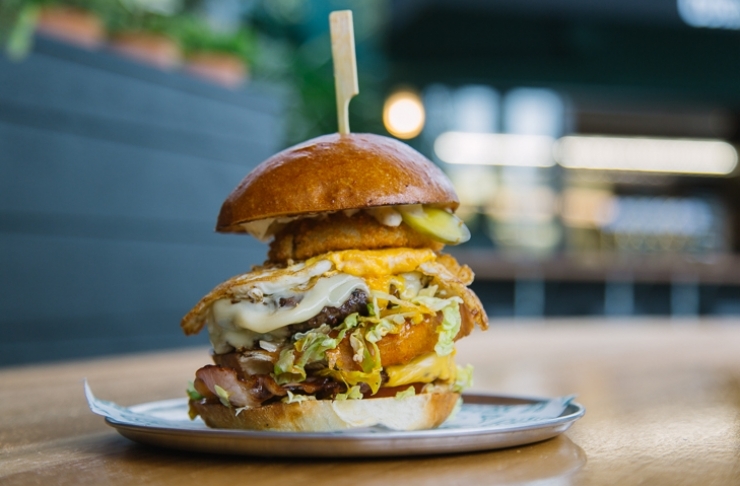 So, after great debate, a few tears and a whole lot of cheese, we narrowed down our list of the best burgers in Auckland. 1. Kicking off our list is… (drumroll, please) and please note this list is not in order because it would be like choosing between children...the pulled pork burger at Burger Burger! 2. No best burgers round-up would be complete without mentioning Big J’s beef and mushroom burger. It’s big, it’s juicy and it will set you back a mere $7. The Mt Wellington takeaway shop has a cult following—and for good reason too. If you haven’t visited yet, get there pronto. 3. If you haven't yet visited Corner Burger, we recommend doing so ASAP. The winner winner is something special complete with crispy fried chicken, deep fried brie, cheddar cheese, bacon, slaw, chipotle mayo and spicy chiptle tomato relish (OMG!). 4. What’s better than a pulled pork burger? A pork hock burger! Meadow are the masters and this renowned burger is not something you want to miss. 5. Grafton cool kids, Ceremony, do a wicked burger. They prefer to call them sandwiches but we’re not one to pull them up on technicalities. We’re a sucker for the bacon, egg and cheddar creation. 6. We’re a sucker for Better Burger’s good ol’ cheeseburger. The brioche bun is perfection and the lettuce is always so damn fresh. Not only does it taste good, but it’s also very Instagramable. 7. Food Truck Garage’s fish burger is both delicious and nutritious—winning! Made with apple and caper crumbed fish, lettuce, tomato and basil mayo this burger will leave you with #noregrets. It's even served on a kumara brioche bun for an added health kick. 8. Curious to try said crispy octopus burger? Pay Tiger Burger a visit. These creative kids have put a Korean twist on the humble burger with ingredients such kimchi, gochujang pork and galbi mayo. 9. For a big burger and an even bigger serve of fries, order The Garden Shed’s burger. Take your pick from the beef and cheddar or the haloumi, avocado and edamame. With lettuce, tomato, mustard, sweet and spicy pickles as well as battered onion rings and bloody mary ketchup. It also comes with a side of skinny chips! Wash it down with a Bloody Mary cocktail to keep your meal in theme. 10. Keep an eye out for The Bearded Clam at a festival or market near you. Their burgers are bursting at the bun. Stock up on napkins because things are bound to get messy. We can’t go past their appropriately named hot mess burger. 11. Visit The Flaming Onion this week (and every week after) to try their ever-changing special. Starring ingredients such as wagyu beef, buttermilk fried chicken and wild venison, these bad boys are not to be missed. 12. Our old mates from Burger Wisconsin never dissapoint with their killer menu. For the vegos we recommend the vege deluxe complete with chickpea falafel, spicy satay, camembert, garlic mayo, salad and relish. Or else the minted lamb burger is sure to knock your socks off. 13. Andy’s Burgers, does a divine fish burger. Think fresh battered fish, remoulade sauce, honey-marinated beets and watercress—served with fries, of course. 14. Not only do we love burgers, but we’re also big on poutine. At Al’s Deli you can get the best of both worlds with a poutine burger that’s literally oozing with cheese and gravy. Ermahgerd is this the real life? 15. Calling all vegans. Say hello to your new fave burger. Drizzled with house-made mac sauce, Ralph’s vegan burger has got it goin’ on. Enjoy with a side of curly fries dipped in vegan-friendly mayo. 16. Don’t be alarmed if you’re served a black bun at Fokker Bros. Their Kiwi Blackburger features a charcoal bun with a juicy Angus beef patty, egg, beetroot and kiwifruit sauce. It’s set to become a national icon. 17. For the best breakfast-esque burger in town, head to Little Easy and wrap your mouth around the El Chapo: showcasing a house-pressed beef patty, guacamole, corn salsa and corn tortilla chips. 18. Those with hearty appetites will love Jar Tar’s whopping beef burger with smoked cheddar and maple syrup bacon. We love how the focaccia bun is topped with crispy deep-fried onion rings. 19. Narrowing down our fave Burger Queen burg is hard work—there’s 35 to choose from! The Beef and Blue Cheese burger is a bit of us. 20. No Saturday night out would be complete without an early-morning cheeseburger from The White Lady on your way home.